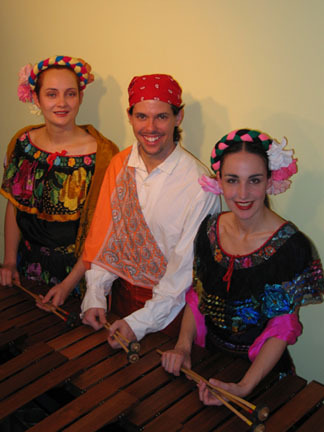 Marimba Nueva York is New Yorkâ€™s only traditional Mexican marimba ensemble. Formed in 2003 to accompany the Ballet Folklorico Mexicano de Nueva York, the group is co-led by Ingrid Gordon and Andrea Pryor de Manrique, who first performed together in the Mexican marimba ensemble at the University of Illinois. The group draws much of its material from the Chiapas region, where the marimba is the state instrument. The group performs in the folkloric costumes of the region, and plays together in the traditional style--together on a single marimba! Marimba Nueva York is based in the Jackson Heights section of Queens, a major center of Latino culture in New York, and one of the most diverse neighborhoods in the country. The group is available for concert performances, dance accompaniment and private functions, adding a dash of traditional Mexican flavor to any event. Hailed by Percussions as â€œone of the rising young stars of the American school of marimba playingâ€�, Ingrid Gordon is a virtuoso who play music from around the world. She is dedicated to performing the traditional marimba music of Mexico, one of the most important sources of Mexican marimba music in the world, and a foundation of the entire Western marimba tradition. 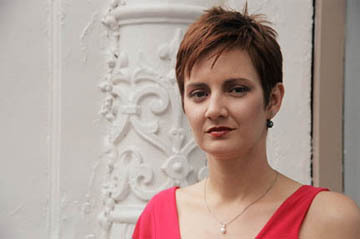 Ingrid is also artistic director of Percussia, an eclectic chamber music ensemble performing a wide variety of works. Ingrid has performed at a variety of New York venues such as at the Stone, Merkin Hall and Advent Lutheran Church, and is a teaching artist for the Brooklyn Academy of Musicâ€™s DanceAfrica program. Andrea Pryor de Manriqueâ€™s is one of New Yorkâ€™s foremost authorities on Latin American percussion, having traveled extensively to Cuba and Mexico to study percussion and Afro-Cuban folklore. Andrea has performed in the legendary Casa de la Trova in Santiago de Cuba and has been invited to participate in PERCUBA in Havana and Fiesta del Fuego in Santiago de Cuba. Andre regularly presents a well-regarded series of recitals showcasing solo and chamber music works for percussion by Latin American composers. She serves on the faculties of Adelphi University, Concordia Conservatory and St. Josephâ€™s College and is a teaching artist for the Museum for African Art. Trey Files is a native of Tyler, Texas and performed with Marimba Yajalon, which toured Chiapas and represented the United States in the Primer Festival Internacional de la Marimba in Mexico City.